LCIA or SIAC: which forum is better and more reliable for a Russian company? International commercial arbitration is a popular tool used by the parties to cross-border transactions with its substantial benefits and advantages such as, for example, flexibility of the arbitration proceedings (the parties and the tribunal have discretion over the procedural elements), and confidentiality. Arbitration is viewed as a universal method for resolution of international commercial disputes also because, unlike state court judgments, commercial arbitral awards may be recognized and enforced in multiple jurisdictions that are parties to the 1958 New York Convention on Recognition and Enforcement of Foreign Arbitral Awards. Structuring of a cross-border transaction often requires a selection of a forum for the resolution of a potential dispute through international commercial arbitration. Until recently, one of the most popular centers of the international commercial arbitration for the Russian businesses in their international trade practice was the London Court of International Arbitration (LCIA). Recently the Russian businesses have demonstrated interest in Asian jurisdictions as a forum for dispute resolution. This is driven, among other things, by changing geography of counterparties and geopolitical risks. • no influence of foreign policy considerations (including sanctions) upon the dispute resolution: unlike SIAC, LCIA proceedings may potentially be influenced by the EU sanctions, including in the form of additional administrative requirements to be complied with by a party to a dispute or LCIA itself. 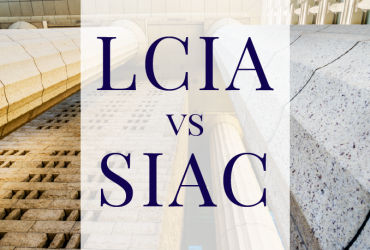 Thus, SIAC is a more competitive arbitration institute as compared to LCIA not only in terms of cost and duration, but also in that it gives assurance to the client that political risks will not affect the dispute resolution process. Hopefully, the development of commercial arbitration in Russia and consistent implementation of the recent arbitration reform in Russia will in the future bring the Russian arbitration system in compliance with the international standards which will allow the Russian businesses to select a reliable forum for dispute resolution not only abroad, but also consider the possibility of having their disputes resolved in the Russian arbitration courts.